In this day when multi-use stadiums have fallen out of favor, it can be difficult to picture a time when a baseball park would host just about any event. 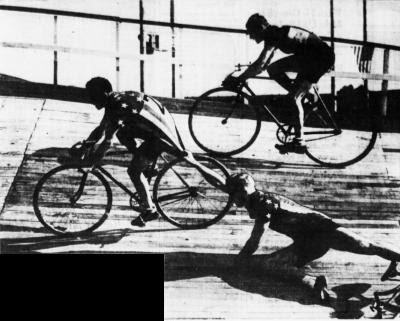 This is Borchert Field, all tricked out with a banked cycling track, hosting a six day race in August of 1936. The Orchard's double-columned light standards are visible in the background. The Brewers must have been on an extended road trip, to free up Borchert Field for six days (plus whatever time they needed to set up and strike the track) in the middle of the baseball season. And a pennant-winning one, at that. So we can add cycling to the list of other sports hosted by Borchert Field, joining football, soccer and ice skating.